This is also my first time celebrating my birthday in the blogging world. I started my blog last November and everything has been great to me ever since. I love what I'm doing and this has been my tool in expressing what I feel. So in return, I also want to include my constant readers and my visitors in celebration of my birthday! These are things you might want to know. 1. This giveaway is open for 30 days. Starts today, June 1, 2013 and ends on June 30, 2013. 2. The winner will be chosen few days after the deadline. Winner/s will be announced on my blog, facebook and on twitter. 3. If you have question, just email me in jayresa03@gmail.com. 4. You have to follow me PUBLICLY so I can see you. 5. MOST IMPORTANT! You have to do ALL mandatory options or you will lose the chance to win the item. Refer to the Rafflecopter below. The prize? Here it is! Again, ACCOMPLISH ALL THE MANDATORY ENTRIES! Failure to do so will forfeit your chances of winning. After doing it, additional entries will be given. You have the option to do it for more chances of winning. Refer to the Rafflecopter below. Please wait for it to load then accomplish all entries. This is open for Philippine Residents only. (Sorry my international readers. T_T ) I hope you like the prize. I will post more giveaways for my birthday month so please watch out for that! That's it! Leave a comment if you join. Include your name, email and location. Goodluck everyone! Happy birthday Tet! More blessings to you, stay happy and continue to enjoy blogging. Happy birthday dear Tet! I'm glad to have found your blog through BC Bloggers. 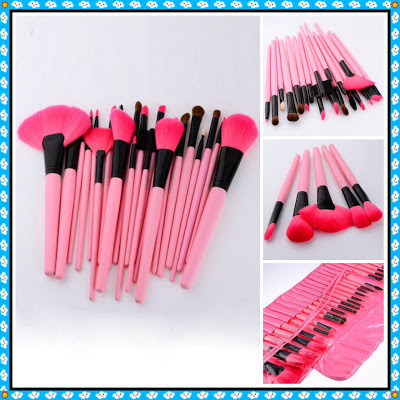 Those pretty pink make-up brushes are soo fun and cute, the lucky winner will surely enjoy it. Happy Birthday and may you have more blessings to come! God bless! I'll show this to my wife and let her join. Nice giveaway! Happy birthday! Good luck in the coming school year. Oi, happy birthday!!! :) I spent the Saturday, June 1st, with my college barkadas. One of us had a birthday too. You got a cool giveaway! I am adik sa makeup brushes! Marissa Bulatao,marie@mommyunwired.com, Baguio City Happy Birthday dear! Happy birthday!!! I am not really into makeup but I like pink! Have a wonderful birthday! I joined! Happy Happy Birthday!!! Thanks for this giveaway! hope i could win this on my birthday! I don't know if you will consider my entries. I didn't like the KPOP entertainment and the first photo because I don't like them. Anyway, in case you consider my entries, here is my details. As long as you followed all the mandatory requirements given, you will stand a chance. I want to win ... its your Birthday! God Bless and always be humble! I really hoe to win. Happy Birthday! Keep Blogging! Great giveaway! Crossed fingers in winning this awesome brush set. wouldve join this contest if i read it sooner.